Dave Cohen has more than 30 years of experience promoting bikes for everyday transportation. He was instrumental in guiding numerous bike and transportation-related projects in the San Francisco Bay Area, including Pedal Express in Berkeley, CA, a bicycle delivery service he founded utilizing a fleet of cargo bikes. Pedal Express gained national recognition for its innovative business model and creative partnerships. In 2015, Dave founded VBike (www.vbikesolutions.org), an advocacy group dedicated to promoting new bicycle technologies and designs to help inspire a shift in Vermont’s bike culture towards a far more transportation-oriented future. 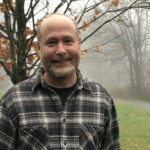 Dave also works as an integrative psychotherapist in Brattleboro, VT, specializing in ecopsychology and mind/body approaches. VBike is a nonprofit organization dedicated to shifting the bike and bike culture in Vermont towards a far more inclusive, fun, and transportation-oriented future. Our main focus is to promote exciting innovations and solutions, including electric-assist technology and cargo bikes, which profoundly expand the range, carrying capacity (children and cargo), hill climbing ease, comfort and the overall utility of biking. To get Vermont moving on these advances in bike transport, VBike has developed a diverse fleet of electric bikes for families, commuters, seniors and others to provide hands-on experiences of these mobility solutions. The fleet, which is unique in the US, has been featured around Vermont for test rides at community events, and workshops. In 1996, VBike piloted its highly successful Take it Home program, providing Brattleboro area residents an opportunity experience to their daily errands and trips by taking home one of our electric-assist fleet bikes for a up to a period of a week. The project inspired widespread adoption of e-cargo bikes and e-bikes in the area. VBike is working to expand the Take it Home program statewide in 2017. VBike also works with VTrans through its contract with Go Vermont (our state’s alternative transportation agency) aimed at providing free bicycle consultations for Vermonters looking to purchase a cargo bike, e-assist system or anything related to bike transport. VBike also provides cost-free support and consultations to the state’s bike shops.